Frank Moses (Willis) is clearly bored with retirement in his suburban home. He is so numbed by his life, that the only thing he looks forward to are the telephone chats he has with low-level public servant Sarah Ross (Parker). Sadly, he has to speak with her whenever one of his retirement cheques goes missing. And then, suddenly, out of the blue, everything turns 180 degrees, and he has to go on the run, when he is marked for death. I hadn’t expected much from this premise or the trailer; middle-aged or older characters return to their original line of work and prove they still have their mojo – it’s practically a genre in itself (we’re getting the band back together). The title is an awkward acronym – Retired Extremely Dangerous. However, my low expectations proved unnecessary. The introduction to the film is snappy, but doesn’t fudge the character development. By the time Frank Moses is being shot at by an unknown assailant, I was hooked by the pace, dialogue and sure-handedness of Schwentke’s direction. Willis has always been the best of the old school action heroes, largely by virtue of being the best actor in that category. When the occasion calls for it, he knows how to move an audience. This is not the turf that RED stakes out. He is required to put a dash of wisdom into his killer with moral code. He’s balanced, he’s patient, he’s an expert, but modest enough not to show off. He’s NCIS’s Jethro Gibbs with a sense of humour. Willis knows precisely how to play this and the audience enjoys spending time in the company of Frank Moses. In fact, all the performances are good. Mary Louise Parker plays another of her tart-tongued, smart women with a goofy streak. 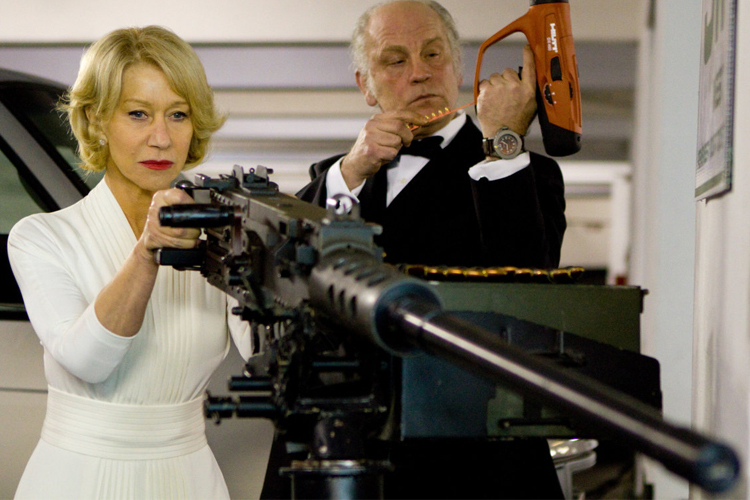 Helen Mirren plays the cool English lady with a gun – that’s practically all there is to the role, but once again, this is plenty. John Malkovich, who is hardly the go-to guy for comedy, plays the burnt-out, paranoid CIA man to T.
The stand out actor for me was New Zealand’s Karl Urban in the difficult non-comedic role of the CIA man who is following Moses’ trail of destruction across the United States. Urban is probably best known as Bones in the rebooted STAR TREK. In RED he shows his acting and movie star chops. He is definitely someone who needs a meaty lead role in a smaller movie to show what he can do. The story is lightweight, its twists and turns are by the book, yet not insulting. RED moves from set-piece to set-piece and always has something interesting up its sleeve – a cameo, a line of dialogue, a clever bit of business. At times the feel and pace reminded me of one of Soderbergh’s OCEAN’S movies complete with light, jazzy score. Director Schwentke’s back catalogue includes the non-compelling FLIGHT PLAN (2005) and THE TIME TRAVELLER’S WIFE (2009), so he has put himself on the map with this latest effort. RED is good, rather than excellent and solid rather than deep. If you want to see an entertaining action flick with some strong comic moments, if you want some escapism with an arsenal of large fetishised firearms, then RED will deliver.